Day 2 of the MasterChef Final. I'm writing this at my mum's house as my husband has gone on a business trip and I am scared of ghosts (TRUFAX). Because I am at my mum's house I have gone slightly deaf as she is slightly deaf and has turned the volume up to 11. Tim, Alex and Drooooov (tm voiceover lady) are about to face "the hardest challenge in the professional world". I'd say neurosurgery is harder, but meh what do I know? For the 1st time ever in the history of the show, our contestants will be put in sole charge of a working restaurant, serving their own menu. 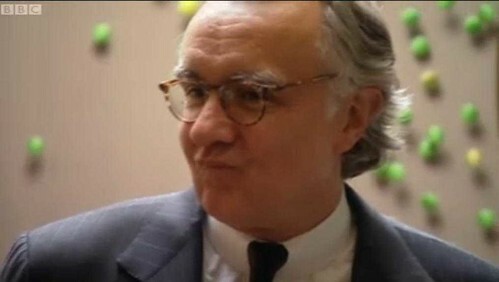 Later they'll undergo "the most terrifying test" ever - cooking for the most revered chef in the world ever ever ever happy sparkle horses and dandelions and daisies 19 Michelin star living legend Alain Ducasse. Some stirring soundbites from our brave men - so stirring they fail to penetrate my head in any meaningful way. "The three finalists have all decided they’re ready to change their lives" says India Fisher and I ponder whether the terrifying test that lies in store for them is in fact gender reassignment surgery. "Prison, like many city restaurants, has a turnover of thousands every night" she continues and by now I'm really confused and wondering if they'll be feeding inmates, but then I realise that she's referring to the slightly more prosaic Prism at Harvey Nicks. There's a sepia flashback showing how far our finalists have come on their journey. Unfortunately I'm staring at Kate Spicer's face and trying to work out if she's done something to it as she looks happier than usual, so I can only remember the bad bits as Tim is criticised for being safe, Alex's modern approach has terrified people and Dhruv can become flustered. We're back at Prism and Gregg yells "These people don’t care about Masterchef; they just want their DINNAH!". John says "I’m seriously seriously nervous" in a way that doesn't betray the slightest hint of nervousness. Luckily all three contestants have commis chefs to help them. Alex is an offal man (remember the pig's ear) so his starter is butter roasted lamb sweetbreads with hazelnut brittle, cauliflower puree, and a blackberry coulis. His mains are osso bucco, saffron fondant potato, pea gremolata, and sea trout. 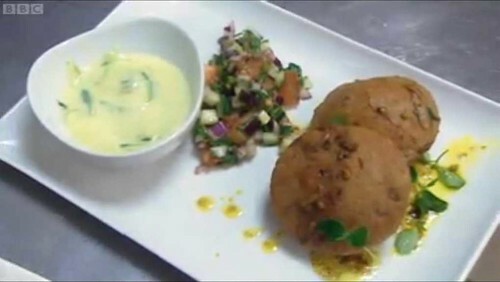 Dhruv's going for spiced duck leg poori, saffron raita and kachumber salad as starter and mains of ballotine of coriander crusted lamb with celeriac puree, and spiced ballotine of guinea fowl, mushroom pilau and chutney. Droooooov's courses are again the most complicated of the three – involving intricate processes. 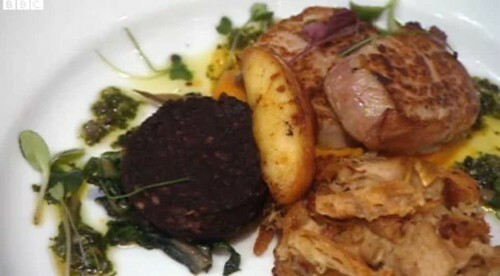 Tim's starter is peeled cherry tomato salad served in a savoury tuile basket topped with basil sorbet and his mains are a pork and black pudding dish, and roast leg of partridge with braised celery and marsala sauce. Assistant manager Jennifer Barratt appears and says "our diners know what they like and what they don’t like" - good-o. John yells that at five to seven one of each dish must be ready for the staff to see and taste - he then picks on poor Alex for having ropey mash potato and psychs out Dhruv by snorting at the number of poori he'll need (100!). The customers have arrived and are now perusing our finalists's menus. One man says "rah rah rah basil sorbet". John is calling out the orders for each table "5 duck poori, one tomato salad" - Drooov's starters are an instant hit. As for Alex's offering, one diner is being told that "Sweetbread is a gland in the neck" and you can see them visibly crumple. Tim's tomato "I'm not blown away" "It looks good" "I'm like a child in a sweet store" "very tasty"
Dhruv's duck "nice but not very warm" "unusual to have duck with spice"
Alex's sweetbreads "This is not bread. I ordered bread". "I wish there were more of it"
I've decided all the diners are peg fools. "I’m gonna let you do service for 15 minutes. If I don’t feel you’re up for it, I'm gonna pull you off". THIS, this is what dreams are made of. THIS is why I started my blog. I'm going to pause to let you digest John's words. Come to think of it, they're a bit rapey. But it's okay - his next words were "I will not endanger anybody's health for anything". Sooooo, when Dhruv loses his wedding ring, it's just a massive anti-climax for me, though I guess it is quite dramatic that nothing’s allowed out from his service till they’ve found it. Anyway they find the ring, so no Heimlich necessary. Droooov must play catch up with his guinea fowl and lamb mains. Again the only problem with the lamb is there's not enough of it (how hungry are these people?). Despite his injury "Doctor Tim refuses to leave service" - I think voiceover lady thinks it's ironic that a medic could hurt himself - oh how I chortle. The veal is slightly dry, the trout is really moist and "slightly underdone from how I usually have it but I like it". Take That plays. In summary, Alex struck a chord; despite suffering bruised ribs, Tim finished his service (which means no happy finish for him); and Dhruv "managed to get my stuff out and not get divorced". It's okay, Dhruv. You're still married even when you're not wearing a ring - although I guess some people think otherwise. In just 24 hrs, Tim, Alex and Dhruv have to cook for "arguably the greatest chef on the planet" but first John and Gregg pull a cockblocking move and demand 60 canapes from each of them - "consistency, beauty and volume in a limited amount of time". Tim's canapes are tomato shots, courgette and Norfolk Dapple cheese wraps with tomato and pepper sauce, and exploding lemon "macaroons". 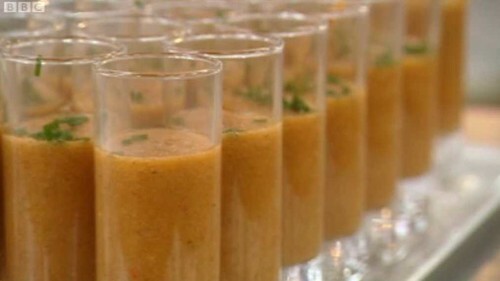 The gazpacho shots are too solid (nothing moves when the glass is upturned); re the courgette, Gregg "can see a lot of spoilt frocks" and he doesn’t like the juice, but the "macaroons" are "fantastic – really nice, well-made macaroons" (no, they're not, they're macarons). Alex has made salmon ceviche with creme fraiche and sorrel on black pepper oatcakes, duck heart and elderberry crostini with cucumber julienne and popcorn shots with black olive toffee. The duck heart for Gregg is "half canapé half Hammer House of Horror – brave and daring, but I want sauce". John is past politeness and says "I will eat them cos it's my job but if I had a choice I wouldn’t". He then decides it "needs more elderberry" - I never expected to hear those words ever. As for the popcorn, Gregg says "Nah, I’ve never drunk popcorn. It's the texture of meat dripping" and John chides "Don’t be so leftfield". 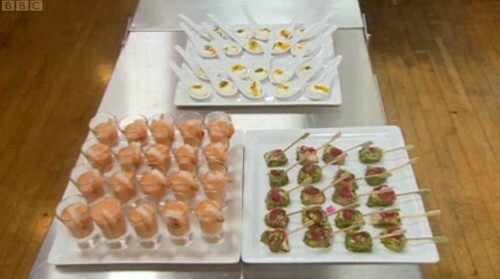 Dhruv's canapes are declared the most visually appealing. 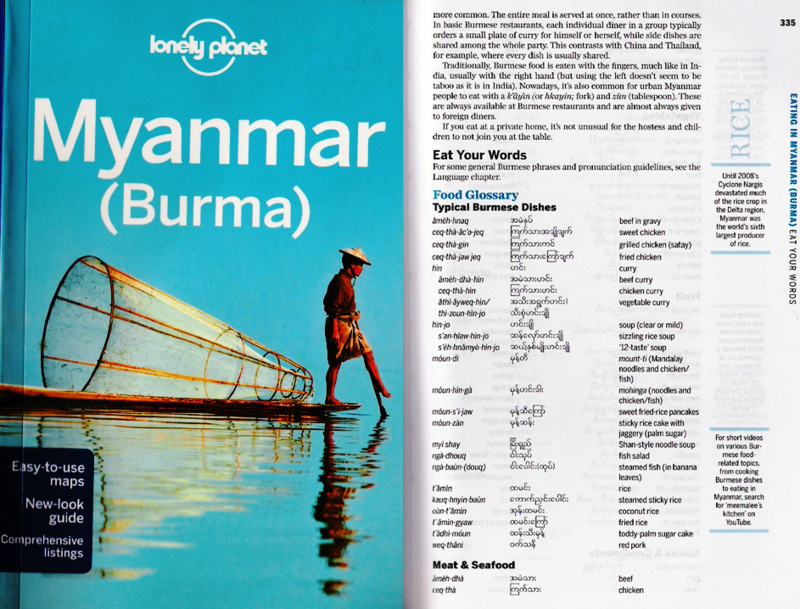 We have salmon with lime, chilli and coriander – "delicious with the crunch of onion"; gazpacho shots with shrimp – "wow fabulous heat of tomato and spice goes well with prawn"; and lastly mango cardamom spoons "Byootiful Alfonse [sic] mango" from Gregg and "Very, very impressive round" from John. Finally it's time for Tim, Alex and Dhruv to cook at 3 Michelin-starred Alain Ducasse at the Dorchester - "the greatest living chef in world - his cuisine is without equal - their skills will be tested by the man with possibly the world’s most brilliant palate". Voiceover lady needs a cold shower. Our finalists will create dishes involving 50 different processes - so labour-intensive that it will take each of them 7 hrs to make one course. F*ck me. Dhruv is responsible for the starter of roasted chicken, lobster, pasta, sweetbreads, chicken "coonelles", "Ferengi" mushrooms and chicken "Jew". I will PAY someone to teach India Fisher how jus is pronounced. Tim is making the main of fillet of halibut, orange jelly, kumquat chips, swiss chard, smoked baba ganoush and ponzu citrus sauce. Lastly Alex is making an intricate, layered dessert of vanilla creme brulee emulsion, pineapple jam, pineapple sorbet, pineapple crisp with a pineapple financier. The chicken mousse for the quenelles looks just like reclaimed meat as Dhruv pushes it through a drum sieve. Next he laboriously makes it into "rigby balls" to poach gently and I'm yelling at the telly "Two spoons, Dhruv! Two spoons! Katie Caldesi taught me that!" Meanwhile Tim caresses an expensive halibut and then focuses on making a harmony of citrus (like St Clements). Chef Jocelyn is concerned he’s following the recipe to the letter and not using his palate - he wants Tim to "feeeeeeel". Alex is fannying around with some scales - each financier has to be exactly 35g of mixture or Alain Ducasse will flay him. Dhruv has moved onto his next task of rolling pasta onto a wooden baton to make sure they’re all exactly the same width - he too fears the wrath of Duckass. Uh oh! Tim has major problems with his orange jelly (it's always the jelly). His commis imperiously says “Remake it”. Mister Alan Duckass will not be dining alone – suddenly there's music so majestically triumphant I’m expecting rose petals and the King of Zamunda himself to roll up. 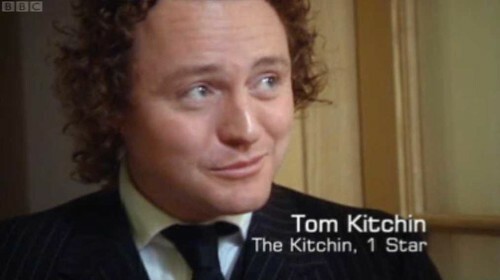 Turns out that five of his Michelin star winning proteges are joining him: Tom Kitchin (the Kitchin), Helene Darroze (Helen Darroze and at the Connaught), Clare Smyth (Restaurant Gordon Ramsay London), Alexis Gaulthier (Roussillon) and Claude Bosi (Hibiscus). No pressure there then. Time's ticking on - a commis says "bum bum bum bum" and apparently that's the cue for the meal to begin. Tom Kitchin is in awe, it's "absolute perfection and top drawer"
Claude Bosi says "you'd pay more money at another restaurant for a dish that was not as good". Clare Smyth says it's wonderful - "I have had this before and it was up there". The King himself says "This is a serious dish and you respect perfectly the origin - congratulations". Dhruv walks out and says he's not gonna forget this day for years and years to come. Tim's fish dish next with its baba ganoush, swiss chard and "multiple citrus elements". Things are clearly serious as the commis chef switches from "bum bum bum bum" to "coochie coochie coo". Tim trumps this with a menschy "oyoyoyooyoy" as his main is sent out to the dining chefs. Tom Kitchin says the baba ganoush is smoked well but the kumquat not quite right. Clare Smyth says she understands there's a lot of pressure and smiles sympathetically. Alexis Gaulthier praises Tim for being a good technician as the fish is perfectly cooked and chard well-braised, but the jus is not reduced enough. Tim seems a little crestfallen and says sadly that "hundreds of people would walk over broken glass to do what I just did today". I feel sad too. I need a hug. Alex's dessert of pineapplepineapplepineapple must have each component clearly visible and the presentation must be spot on. The Legend says "tres bien - you can smell it". Claude Bosi asks him "Are you sure it's not one of your chefs? It's perfect". Alexis Gaulthier says "it's like eating a pineapple cloud" and tells Alex "You are supergifted". Helen Darroze looks like she wants Alex's children when she purrs "That was perfection". Alex looks happy as he leaves and gives us the understatement of the year "That's quite a special moment really". Then he realises that this is not good enough and declares "It's like going into the World Cup Final on the back of an eight nil-win. Any self-doubt that remains has gone straight out the window". Bit more like it. 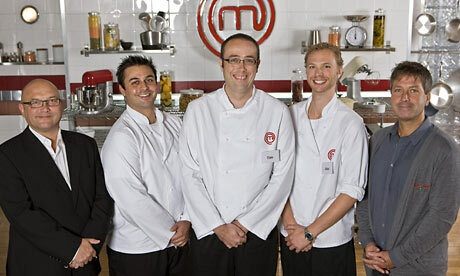 Tomorrow night one of them will be crowned MasterChef champion"
And then I'll be free. Ha, I came here to see if you blogged 'pull you off' too - of course you did, doh! Oh frabjous day - the essential digestif for Masterchef has arrived. Loved last night's show; possibly the most mad MC programme ever. Thank you! Is this a bad time to admit that over the last few weeks I've actually found *Australian* Masterchef to be far more dramatic and interesting? Great post, though - thanks. I enjoyed it more than I did last nights episode! 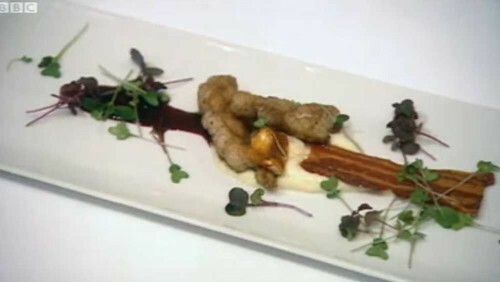 I thought I was going to wet myself when that woman thought the sweetbreads were actually bread. Brilliant. @fran39 - This post practically wrote itself. @Matt Chatterley - I wish I had Watch - everyone's been saying how good MC Australia is! @emmizzykay - She was gold. Loving it! 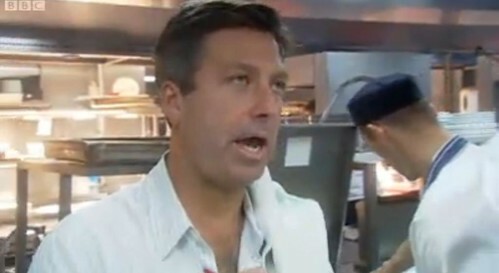 Watched the Tim/Torode moment and immediately thought of you (that sounds a bit wrong now). I think Shahrukh Druv has the edge now but let's see what tonight brings. Bom, bom, bom, bom! Really funny and a joy to read. Also saves me watching the bloody programme. @aforkfulofspaghetti - Impossible! Nothing is better than MasterChef! 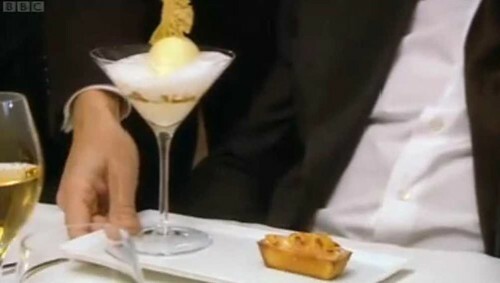 I blogged Great British Menu before you know. I enjoy making gifs of Oliver Peyton's face. This has made my day... I am very sad to be missing the final tonight (bloody work). Boo. Someone from a neighbouring office just came in to ask if I was all right to find me whimpering with laughter and pointing at the monitor. I was trying desperately hard not to laugh too loudly! Stunningly funny and also that very rare thing, witty. 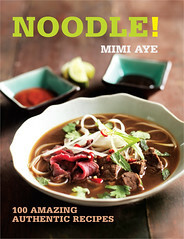 Brilliant MiMi, just brilliant. @chumbles - Hope they don't think you're mad now. When I was 16 and moved schools, a girl said to me "I'll miss you because you're witty". Seemed like an unbelievable insult at the time but now I rather like it. Glad you covered it as I missed it last night! "unusual to have duck with spice"
"This is not bread. I ordered bread"
The customers do seem like idiots. But then, so are Gregg and John. @Su-Lin - You're welcome! I was kinda torn myself because I really wanted to see Heston's Chocolate Feast but then who am I kidding - MasterChef is my first love. @Su-Lin - You're welcome! I toyed with watching Heston's Chocolate Factory Feast instead but who was I kidding? MasterChef is my first love. Also, yes. Yes, they are. I came upon your blog via Kavey's blog Kavey Eats. Your write up of yesterday's masterchef is soooooooo funny, I can't stop laughing! I enjoyed watching the 3 boys sweating it out in different kitchens, especially the heat of Rajasthan. The doctor fellow looked in pain most of the time, even before he had the accident, bless him! 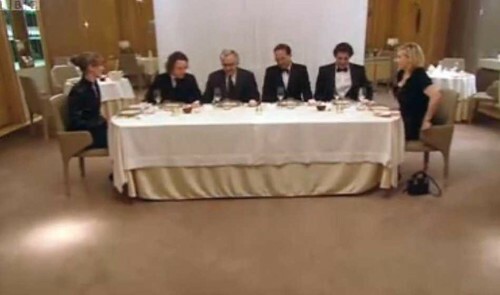 I can't say anything about how funny your Masterchef spoofs are cos you will get too big for your boots.. So all I will say is Get Bigger Boots!! "Nah, I’ve never drunk popcorn. It's the texture of meat dripping" ILU Gregg. "My favourite character from Lord of the Rings"
I'm off to Edinburgh to check his feet. He is a total hobbit. Why did I not notice that? Another fantastic post, couldn't stop laughing my head off :-) Though a teeny bit of me is bloody glad am not in that situation. Can't wait for tomorrow Mee!! Great post - I'm going to miss your Masterchef posts - can you start to get obsessed with Great British Menu? The man in the Harry Potter glasses does great comedy - mainly unintentional I think! @Josordoni - I'm only a size 4! @I heart cupcakes - Am so glad someone else heard it otherwise I would have thought I'd imagined it.